Understanding the quality of the customer experience associated with the services that you provide is a critical success factor for organisations supplying voice, video and data communication services be they mobile or fixed. 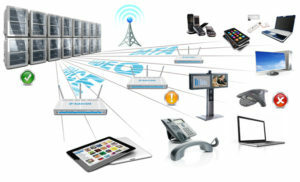 StreamCentral can gather detailed information from all relevant points that play a part in a voice or video call, from the core network of a service provider (e.g the IMS network of a Telco) through to individual fixed devices that sit on a customer’s own network or mobile devices that they may be using to make the call. This information is gathered, correlated, analysed and reported on in near real time, as the call is taking place. Correlating information about an event, in near real time, across all the devices associated with that event allows service providers to rapidly identify the nature of service issues as they appear and as well as allowing for Quality of Experience issues to be detected, often before they are regarded as issues by customers. Having all the information about an event (say a mobile video conference call) is only part of the solution. Overlaying this with appropriate context based knowledge that helps customer support teams and engineers to deal with issues rapidly is another element of the solution that StreamCentral provides. This is particularly important when new complex solutions are first launched. To provide a comprehensive solution for the management of customer experience, StreamCentral has already been integrated with a range of different real-time data sources from several specialist suppliers (everything from RTCP-XR voice packets generated from a fixed phone through to systems that monitor the activities across an entire IMS network). Monitor Voice and Video call quality on the actual devices used by the customer – fixed phones, soft phones and mobile phones. Utilise the most accurate algorithm to calculate Mean Opinion Score (MOS), giving the best possible understanding of the quality that a customer actually experienced on a call. Monitor the quality of call communications when using unified communications applications such as Microsoft’s Lync. Monitor every element of a communications IMS network. Monitor Access Devices for call quality as well as QoS and bandwidth utilisation, by application type. Monitor any type of application server that is concerned with supplying call related services, providing information about capacity, performance, CPU utilisation by application, which applications are running at any point in time, etc. Reflect either passive or active monitoring. Scale to any size of organisation/customer base. Have user defined alerts to identify any condition across one or more sources of data. Manage Alerts efficiently, enabling customer service teams to focus on the main issues that need to be addressed without being swamped by detail. Map appropriate knowledge of hardware, software versions and issue resolution to alerts that are triggered by incoming data and make this knowledge easily available, in context, allowing customer services teams to resolve complex issues more efficiently without the need for as many expensive experts. Identify whether a quality issue is being caused on the Service Provider’s IMS, at the customer Access Device, in the customer’s network or on a specific end user device. The operational insights provided by StreamCentral are displayed on custom made operational dashboards, each reflecting the specific operational needs of a given customer – some examples are provided below. As service providers see data traffic increase, our Network Assessment solution helps identify and isolate bottlenecks that prevent optimum customer experience for specific applications in specific locations, by providing end to end data from application, the core network through to end devices. When looking to bring new applications or services to market, Network Assessment helps service providers measure and benchmark customer experience in specific locations by providing end to end insight about performance and user experience from the application/service through to the end devices. Network Assessment is the only comprehensive solution available today that is relevant to field test teams, system analysts, systems architects, engineering departments and cell planning departments of Service Providers. It is built on around StreamCentral which makes it easy to integrate the custom data needed to measure and deliver optimum customer experience. The Network Assessment solution suite delivers objective and subjective insights that give a clear and comprehensive understanding of customer experience. Objective insights include information from the core network, end user devices and cellular/Wi-Fi networks for a single event generated by the service or application being tested in a specific area. Subjective insights are in the form of easy surveys that can be filled out by the field personnel for selected events or an entire test. A summary of each of these is described below. The Network Assessment End Device Software is installed on the device(s) that field test personnel will use to test the services and applications that are to be launched. The Network Assessment End User Software runs as an app on Cellular/Mobile platforms and on Windows platforms and is utilized to assess the effectiveness of the end to end network for Voice and Video applications that connect through Cellular, Wi-Fi or Ethernet channels from a PC or a mobile device. Configuration of test parameters can be set centrally by a central administrator ensuring all field personnel are testing uniformly. In addition, separate configurations can be set for different personnel allowing different parameters to be tested in different geographic areas, or by different types of people, as needed. Select if tester needs to provide survey at the end of each event in a test or at the end of the entire test. The survey questions can be changed dynamically as needed by the central administrator. Below is a selection of screen shots from the Network Assessment End Device Software. StreamCentral is massively scalable and can process millions of events per second, with information coming in from devices and networks all over the world. As StreamCentral receives information from different sources it calculates key metrics and correlates those records that relate to the same event. StreamCentral stores information about each event for subsequent analysis. A rich set of near real time analytics has been provided as part of the Network Assessment solution suite. This provides insight into existing network trouble areas and network readiness prior to implementing and bringing a new service or application to market in specific locations. Below is an example of the type of reporting that the solution suite produces.